Bangladesh’s pharmaceutical industry is unique among least developed countries (LDCs). Driven by active government policies, output has grown a thousand times since 1982, to US$2 billion, or around 1% of gross domestic product, making it the biggest white collar employer in the country. The industry supplies almost the entire domestic market and more than 100 other countries including the United States. It’s of some concern, then, that if Bangladesh potentially leaves the LDC category in 2024 it’ll no longer have access to a special World Trade Organisation (WTO) waiver which exempts the industry from the Agreement on Trade-Related Aspects of International Property Rights (TRIPS). The exemption has allowed government to pursue a dedicated industrial policy that’s spurred growth until now. Most of the hundred or more pharma companies operating in Bangladesh make so-called generics, or non-branded medicines, the patents of which have often expired. Around a fifth of drugs produced in the country are patented in other countries, something which is made possible by the waiver which until 2033 allows LDCs to produce patented drugs without first asking patent holders. The most obvious benefit of the waiver is that companies can make whatever drug they want, drastically cutting costs and improving availability. Bangladesh’s 1911 Patent Law would contravene the TRIPS agreement in a number of ways, among other things because it only provides patent protection for 16 years, not the required 20. No patent protection exists for plant and animal varieties; compulsory licences can be introduced by entities other than government; and foreign patents can be cancelled after four years if the product is not also manufactured domestically. The Drugs Act allows government to regulate how imported drugs are labelled, requiring complete formulaic information to be visible. The Drugs Control Ordinance of 1982 lets the authorities fix prices and restrict the imports of any medicine if it or a substitute is produced in the country. Under the waiver Bangladesh as an LDC can export generic versions of patented drugs to any country where those drugs aren’t covered by patents or where compulsory licences are issued to treat diseases like cancer or HIV/AIDS. Vietnam, Myanmar and Kenya are currently key markets. Perhaps most importantly, weak intellectual property protection has also allowed Bangladeshi firms to build their technological base by imitating or reverse engineering foreign technologies. Copying and reverse engineering is critical to economic catch-up in a range of industries, not just pharmaceuticals. Rather than start from scratch, developing-country firms can take advantage of what others have learned. First, Bangladesh would have to update its patent law, increasing patent terms to 20 years, extending patents to pharmaceutical products and processes, and allowing patent protections on animal and plant varieties. Patents could no longer be cancelled simply because they are foreign-registered, and compulsory licenses could only be issued by the government. Bangladesh would have to let foreign companies file for an injunction if a patent was infringed so that the authorities could seize those goods. The government could no longer insist that the ingredients of imported drugs were displayed on packaging for fear of revealing trade secrets and interfering with manufacturers’ marketing strategies. After graduation Bangladesh would also probably have to abandon the import restriction strategy pursued under the 1982 drugs control ordinance, again because it would conflict with WTO rules. Irrespective of the loss of the pharmaceutical waiver, it’s unlikely that the general TRIPS exemption for LDCs will be renewed after its expiry in 2021. Although this is before Bangladesh’s potential graduation date and would therefore have an impact irrespective of graduation, complying with TRIPS would be expensive. The government has already said that it will upgrade its intellectual property system in accordance with TRIPS, earmarking projects worth US$71.04 million.2 Among other things this includes an overhaul of the Patent Act. A 2014 draft law is still under review by the Ministry of Industry. Some commentators argue that strong protection of intellectual property under TRIPS will stimulate innovation, attract foreign direct investment and foster technology transfer, promoting development.3 Bangladesh would compete on a level playing field, with private companies confident that their intellectual property wouldn’t be stolen. On this line of argument, intellectual property rights are said to incentivise innovation by preventing free-riding and increasing the rewards from investment. Bangladesh would also have to bring its laws into line with WTO agreements other than TRIPS, such as the WTO Agreement on Subsidies and Countervailing Measures. This may bring into question the services and facilities given to local drug manufacturers under the National Drug Policy of 2005. Full compliance with WTO rules would require that infant pharmaceutical corporations compete in the global market with little financial support from government. Ultimately LDC graduation risks derailing the process of technological learning that has spurred growth until now. The industry body expects recent annual compound growth rate of 15% to continue into the medium term. Without mitigating measures, this growth may slow, with broad-based economic, employment and public health implications. As a potential middle-income country, Bangladesh’s main challenge is to keep moving up the technological ladder, adding value and moving away from low-cost production. More importantly, limiting the activities of pharmaceuticals producers could raise prices for Bangladeshis who couldn’t otherwise afford vital drugs – as well as buyers around the world. Life-saving medicines would no longer be available for poor people in Bangladesh, LDCs and other developing countries. What appears likely in the event of graduation, and without any new measures to mitigate the impact on graduating countries, is that the industry will undergo consolidation, with established international players buying up smaller local companies. The possible new foreign investment may bring new technologies and working practices, with a knock-on impact on production – although nothing is certain. Whether the industry is robust enough to withstand and adapt to this consolidation remains to be seen. Women in a training centre for traditional handicrafts, a project assisted by the United Nations. Bangladesh, the largest least developed country (LDC) in terms of population and economic size, looks likely to leave the LDC category by 2024, propelled by better health and education, lower vulnerability and an economic boom. The country for the first time met the three criteria for graduation at the Committee for Development Policy (CDP) triennial review in March 2018. Bangladesh’s success comes on the back of six straight years in which economic growth exceeded 6%, culminating in some of the fastest growth rates in the world in recent years. Per capita gross national income has outstripped the LDC average since 1996 and has recently risen above the threshold used by the CDP. The economy has developed largely via textile and garment exports. Clothing forms a higher share of exports than in any other country. Remittances, natural gas, shipbuilding and seafood, as well as information communications and pharmaceuticals are all emerging sources of foreign exchange and economic growth. This economic boom has helped the poor. Since 1990 about 50 million people left extreme poverty, as defined by the World Bank, a reduction in the poverty rate from 40% to 14%. 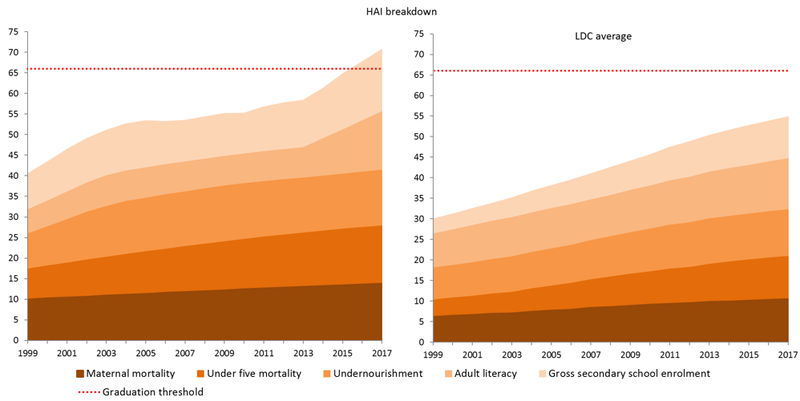 Bangladesh’s thriving non-government organisations have helped provide vital health and education services to the poor, translating into rapid improvements in the human assets index used by the CDP. An increasing volume of global garment production is being offshored from China, providing additional opportunities for countries like Bangladesh. Meanwhile the economy is gradually diversifying, particularly into services, which do not face goods tariffs and which are therefore less affected by LDC graduation. 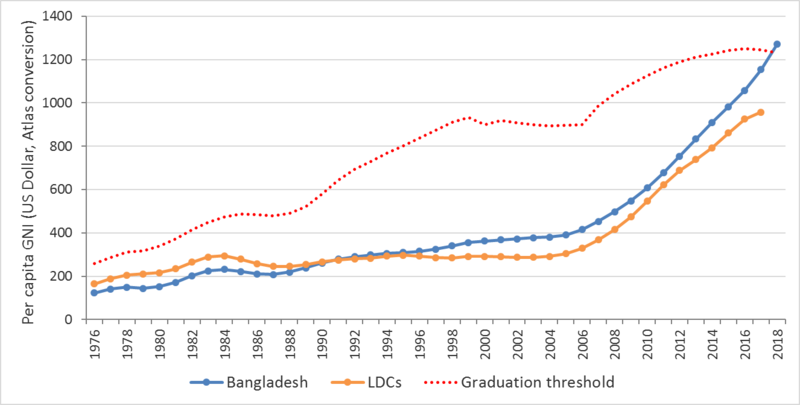 Bangladesh’s LDC graduation is certainly not the end of the story. Although a move on to the next rung of development is a major milestone in the nation’s history, pressing economic challenges remain, such as how to raise wages for the working poor without losing international competitiveness. 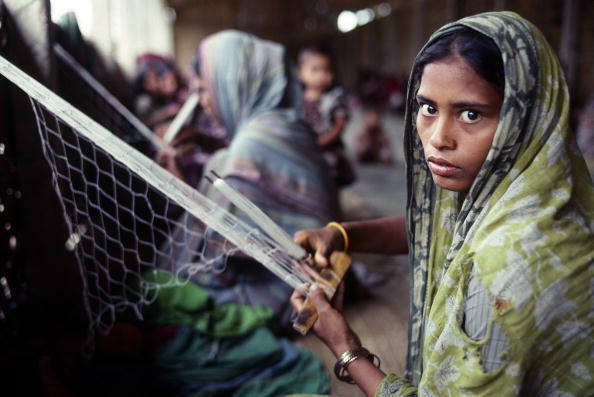 Bangladesh’s comparative advantage currently lies in cheapness; yet low wages by definition perpetuate income poverty. Although extreme poverty has fallen, many people remain in low-paying jobs. Population pressures, climate change and the automation of production are ever-present challenges. How the country navigates its journey into middle-income status will be one of the defining issues of the coming decade. Bhutan first plugged in to the Internet and TV in 1999. So isolated was the tiny Himalayan nation that until then World Cup soccer fans had to drive to the Indian border to buy videotapes of the latest matches, which they would watch a day late. Picture the scene seventeen years later: at Thimphu TechPark, a government-run technology hub, a dozen coders hunch over flatscreen monitors. Downstairs, teenagers bark at Europeans through headsets. Soccer is a click away. The success of Thimphu TechPark explains why Bhutan is moving so quickly toward its goal of graduation from the least developed country category (LDC). For the second time the country was found eligible for graduation at 20th triennial review of UNDESA’s Committee for Development Policy (CDP) in 2018, paving the way for graduation in 2024. The government is preparing for graduation by putting in place policies to diversify and develop productive capacity. The TechPark is exactly the kind of initiative that the project aims to support with policy proposals. “Initially people expressed a lot of skepticism about the park,” says CEO Tshering Cigay Dorji, “but these things take time.” It was only after US online photo company Scan Café ramped up its initial 20-strong pilot project in May 2013 that 11 others followed from Bangladesh, Switzerland and elsewhere, specializing in telecoms, business process outsourcing and online data. Scan Café showed that Bhutan was a good place to do business. Most of the ingredients were already in place – good education, competitive wages, cheap electricity and low rent – they just hadn’t yet been used in IT. Most Bhutanese are taught English from an early age, and the country scores particularly well on the human assets index that is part of the official LDC category. Bhutan is following a path well-trodden by successful tech exporters: start small and cheap, discover markets through trial and error, and move into more sophisticated activities later on. Government leadership is strong. The national vision, Gross National Happiness (GNH), aims to “maximize the happiness of all Bhutanese and to enable them to achieve their full and innate potential as human beings”. According to the Bhutan Diagnostic Trade Integration Study (DTIS), IT fits well with the GNH environmental vision. E-commerce and e-government have a low environmental impact because they localize service access and delivery and are more efficient than old, carbon-heavy industries. It’s too early to tell whether the TechPark will transform the economy. But in a tiny, remote LDC that only opened up to the outside world less than two decades ago, Thimphu TechPark is a remarkable success story, and the kind of policy initiative which the UN should continue to support. Powered by better health and education, lower vulnerability and an economic boom, Bangladesh, the largest least developed country (LDC) in terms of population and economic size, looks likely to leave the LDC category by 2024. For the first time, the country met the three criteria for graduation at the triennial review of the Committee for Development Policy in 2018.